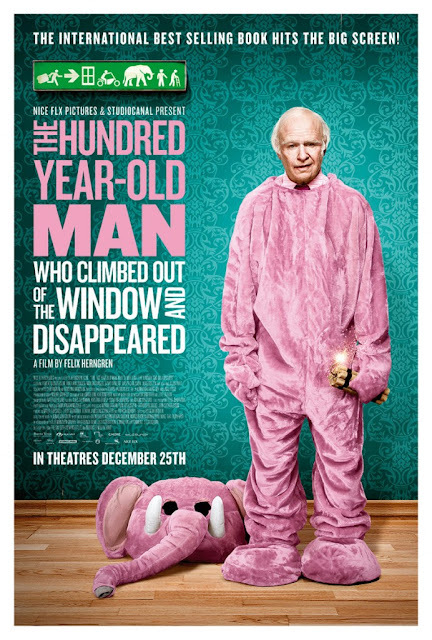 Based on the internationally best-selling novel by Jonas Jonasson, the unlikely story of a 100-year-old man who decides it's not too late to start over. For most people it would be the adventure of a lifetime, but Allan Karlsson's unexpected journey is not his first. For a century he's made the world uncertain, and now he is on the loose again. Critics Consensus: Its efforts to earn laughs can be as ungainly as its title, but for viewers in tune with its absurdist humor, The 100-Year-Old Man Who Climbed Out the Window and Disappeared offers much to recommend. CHECK OUT THE MOVIE AT YOUR FAVORITE VIDEO ON DEMAND SERVICE OR PICK UP THE DVD AT AN ONLINE STORE OR TRADITIONAL STORE NEAR YOU! 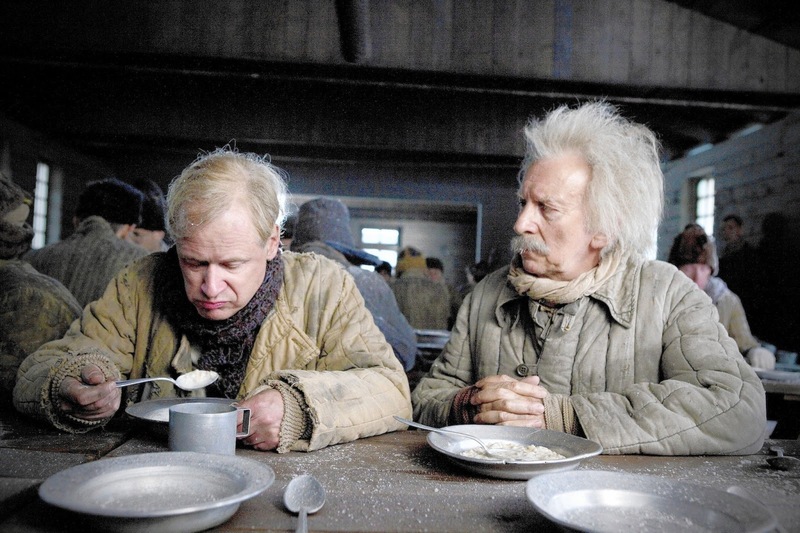 So this movie with the very long and odd title was originally a 2009 Swedish book titled 'Hundraåringen som klev ut genom fönstret och försvann' and was the first book by Swedish author Jonas Jonasson. A year later it became the bestselling book in Sweden and by July 2012 had sold over three million copies worldwide. The audiobook read by Swedish actor Björn Granath even won the Iris Ljudbokspris award in 2010. I remember seeing this book at the bookstore and thinking that it would be an interesting read but never really got round to picking it up. Now this and a couple of others are going into my to-get booklist. By November 2010 Swedish Director Felix Herngren announced that he would direct the film adaptation of the book as well as co-write it. Upon completion it was screened in the Berlinale Special Gala section of the 64th Berlin International Film Festival and after being screened in more than 40 countries worldwide and grossing over 50 million US dollars, it became the third highest grossing Swedish film of all time beaten only by The Girl With the Dragon Tattoo (Män som hatar kvinnor) (2009) and The Girl Who Played with Fire (Flickan som lekte med elden) (2010). Pretty impressive feat in my opinion. 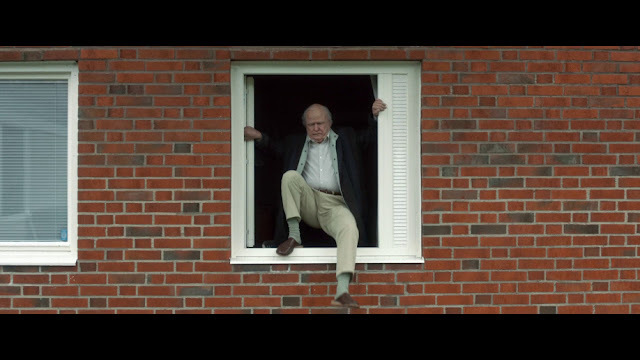 Anyway, on to the film which is about Allan Karlsson (Robert Gustafsson) who on the day he turns 100 decides that he'd rather climb out the window than have a birthday party hosted by the folks at his retirement home or old folks home as they're called in some places. He wanders off towards the bus station and there asks the man at the ticket counter how far the change in his pocket would take him. After a quick and somewhat confused back and forth he settles on a ticket to Byringe, a place where there's apparently nothing of interest. As Allan is waiting for his bus an angry young man comes into the station and tells him to watch his luggage for him while he heads into the washroom. Just as the young man closes the washroom door Allan's bus shows up and instead of just leaving the luggage at the washroom door he takes it with him on the bus. Meanwhile, the birthday revelers have come to celebrate Allan's birthday only to find his room empty, a search immediately begins for Allan. Allan eventually ends up in Byringe at a small little yellow house that used to be the train station but since the train no longer travels to Byringe it's now home to Julius (Iwar Wiklander) who himself has refused attempts to be placed in a retirement home by his loved ones. Back at the bus station the angry young man Bulten (Simon Säppenen) discovers that his luggage is gone and forcibly enlists the man behind the counter to help him search for it using his car. The young man eventually arrives in Byringe by foot after the car runs out of fuel and discovers the little yellow house. Inside he spots Julius alone. He enters the house and begins to threaten Julius. Allan is outside relieving himself when he hears the commotion inside, as he enters the home he looks at a few items by the door before settling on a mallet as his weapon. When he enters the kitchen where he left Julius, Bulten's back is to him and with a confident swing of the mallet he knocks Bulten out cold. Worried that Benny might come to and overpower them they drag him to the freezer and lock him inside. Now confident that no one will bother them they satisfy their curiosity about the luggage that Bulten is so eager to get back and when they open it they discover that it's full of cash. While they begin counting how much money there actually is in the luggage Bulten comes to and begins to make a racket trying to negotiate his release, Julius decides he needs to cool down and turns the freezer on. When they finally finish counting they discover that there's 50 million Swedish Krona in the bag. They toast their discovery and have a few drinks before they decide what next to do about Bulten and the money but before they know it it's the next morning and when Julius decides to check on Bulten who has gone quiet as a mouse they discover him dead. Meanwhile the police are now involved in the search for the missing Allan Karlsson. And so begins a chase and search around Sweden for Allan and Julius. The chase being done by Bulten's gang looking to get their 50 million Krona back before their boss Pim (Alan Ford) does something very bad to Gäddan (Jens Hultén). The search by the police looking for the missing Allan. And during their run around Sweden the meet Benny (David Wiberg), a not so young and indecisive young man and Gunilla (Mia Skäringer) a single woman living in the middle of nowhere with an elephant kidnapped from a traveling circus. And in between their escapades we learn about Allan's past through flashbacks which introduce us to a young Allan who enjoys blowing up things, a teenage Allan who is placed in a mental institution and is castrated in order to cure his unusual interest, Allan as a young man who ends up working at a factory making canons and who befriends a Spaniard who eventually convinces him to join the Spanish rebellion where he becomes and expert bridge destroyer who inadvertently saves the life of the man he is supposed to be fighting against, to working on the Manhattan Project which eventually created the bomb that ended Japan's interest in fighting any war ever again. Also he ends up in a Russian gulag where he becomes bunkmates with Albert Einstein's not so smart brother and he works both sides of the Cold War when he becomes a double agent for both sides. The movie ends with Allan, Julius, Benny, Gunilla and her elephant in Bali with the bad guys chasing them all no longer looking for them. The police? They've stopped looking for him too. So was this Swedish book to Swedish film good? 50 Million US Dollars in 40 countries can't be wrong. And for the most part they're not. It was an an entertaining little movie. At the end of it I was thinking it was sort of a combination of Forrest Gump (1994) and Dumb & Dumber (1994) which I've just noticed came out the same year. Now why did I think that? Well, it has two male leads both of whom aren't the smartest in the world but somehow manage to bumble along escaping the people that are after them which of course they don't seem very much aware of being chased. And then there's the flashbacks that Allan narrates where we see him again bumbling from one situation to another, one job to another and meeting interesting historical characters as he does so. And of course like Forrest he makes an impact in those peoples lives and unknowingly participates in events that make it into the history books but in Allan's case he isn't credited for it let alone recognized by history. That's the two main reason why I thought what I did. And because of that combination and the fact that the two male leads are senior citizens it made for a very unique and quirky little movie. 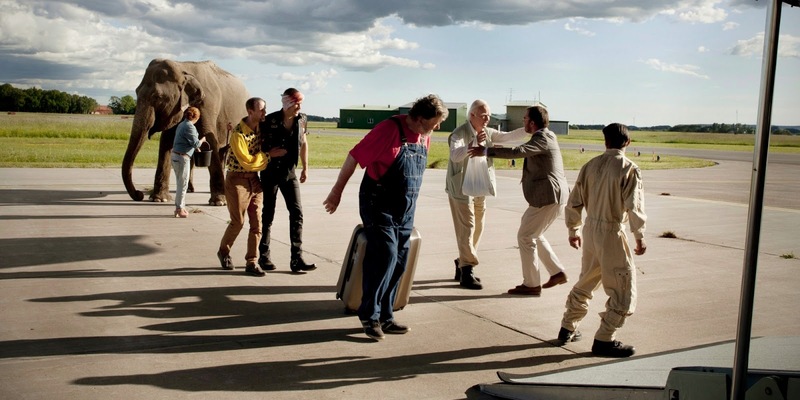 Add to that that it is a very Swedish film and it makes for an interesting and unusual comedy as well. And even though it is a distinctly quirky Swedish comedy a lot of the humour isn't lost in the translation. Most of the humour comes from the situation that Allan and his friends find themselves in. Very little of it being too culturally foreign for those not Swedish. The performance given by Robert Gustafsson was thoroughly entertaining. Once he was in make-up he was quite believable as a centenarian and when he plays the young Allan the way he bumbles about in his naive way very much reminded me of the Tom Hanks played Forrest Gump although not as good of course. Visually the film isn't all that bad. It works to tell the story and there's little fancy work done visually. If you're looking to see how lovely Sweden is you'll be disappointed. The upside visually is the care taken in the flashback sequence with regards to costumes, props, the background as well as the historical doppelgangers that Allan meets with. 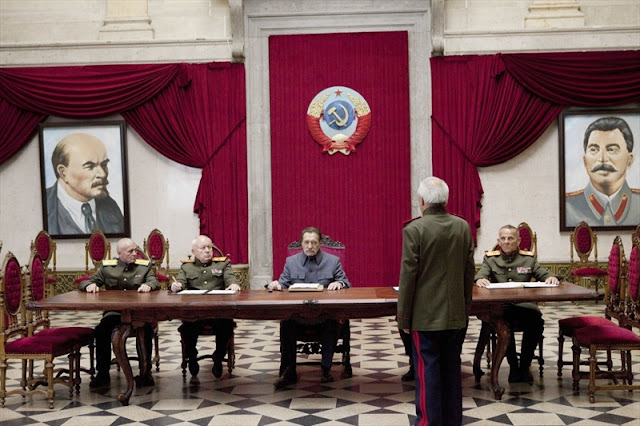 Instead of relying on CGI and fancy editing of old newsreels they used actual sets and props and actors who looked almost like the people who played them. There is no attempt at making them look exactly like their real historical counterparts like Robert Zemeckis did in Forrest Gump. There is no real attempt and making things as accurate as can be and I appreciate that. That just adds to the quirkiness of the film. I found little to find issue with with this film. The characters were interesting and entertaining and the story was quirky and funny. The story unfolds at a pretty good pace and you are kept interested almost the entire time with the exception of at about two thirds of the way in when the a little of the pace is lost and it gets a little dull. So there it is, a movie from two years ago adapted from a book that I wanted a read. I enjoyed the film and I'm guessing I'll enjoy the book even more when I eventually get my hands on it. I'm giving this movie a decent 3.1 out of 5. Definitely worth checking out if you can get your hands on it. CAUGHT THIS FILM AT THE 16th EUROPEAN UNION FILM FESTIVAL HELD ANNUALLY BY GSC CINEMAS COURTESY OF BFM RADIO. IT'S MY SECOND YEAR IN A ROW THANKS TO THEM! !